Today was the last (3rd) day of our course. We started the day with 1 hour lecture on Man Overboard procedure and then performed the maneuver using J-24 boat. It was really a challenge to do since putting a moving sailboat to a full stop is not nearly as easy as pressing on your car's brake. But it was really a good training. The MOB drill required you think and respond with a "cool head". I wonder why they don't use WOB instead? I think it would make the crew rescue faster :) Or BKOB for "Bikini Girl Overboard!" would certainly be more fun to do. The sequence of MOB drill was quite long. From yelling "Man Overboard!" to continuously spotting them to throwing life buoy and making sure you know how to quickly get down wind from him and then to pick him on a close reach point of sail. The second half of the day was for learning and understanding navigational signs along the bay. It was not easy since the signages were different from what you'd normally see on the read. Plus, there were no lanes nor clear pathways you could follow. Depending on vessel class, you'll almost have to remember so many different rules on who is supposed to "Give Way" and who should adopt "Stand On". In late afternoon we had no wind for a good 20 minutes but then we had a good consistent 8 knots followed by a refreshing shower from the sky, just when we were having so much fun in 60 feet depth waters. Luckily, the sea traffic wasn't so bad perhaps due to the upcoming holiday season for most Singaporeans (Lunar New Year that is). We later sailed back to the marina at 5:30pm, tidied up the boat and enjoyed cold beer courtesy of Klaus. It was a great way to end the course, indeed! Derek Mazzone did a great job coaching us and making us do real physical work on the boat and pontoon. 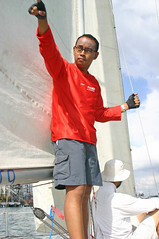 He has made us feel confident handling the boat. If you are interested, please feel free to sign up at RSYC. I highly recommend his practical teaching methods. Some sailors said: Sailing is just like riding bicycle. Once you've done it, your muscles will remember how to do it again, and again, and again.